Global warming has amplified the intensity, duration and frequency of extreme heat and heat waves. The National Academy of Sciences reports and validates numerous studies as well as two major science assessment reviews that definitively identify the fingerprint of human influence in driving the changes observed to date. The climate has shifted significantly, leading to more heat records in every season. The number of local record-breaking average monthly temperature extremes worldwide is now on average five times larger than expected in a climate with no long-term warming. The trend in global warming has contributed to the severity and probability of 82 percent of record-hot days globally. How hot is it out here in the America West? Did We Just Blow Past the 2˚ “Limit” for Global Warming? Charts: More Hot Days Across the U.S.
Infographic: What is an anticyclone? Extreme heat and heat waves in the United States and around the world are some of the clearest impacts of climate change on extreme weather. The fingerprint of global warming has been firmly identified in the increasing intensity, duration and frequency of extreme heat events in the United States and globally. Four out of five record-hot days globally are now amplified by global warming. Global warming contributed to the record for hottest day of the year globally in at least 82 percent of the records over the 1961-2010 period. 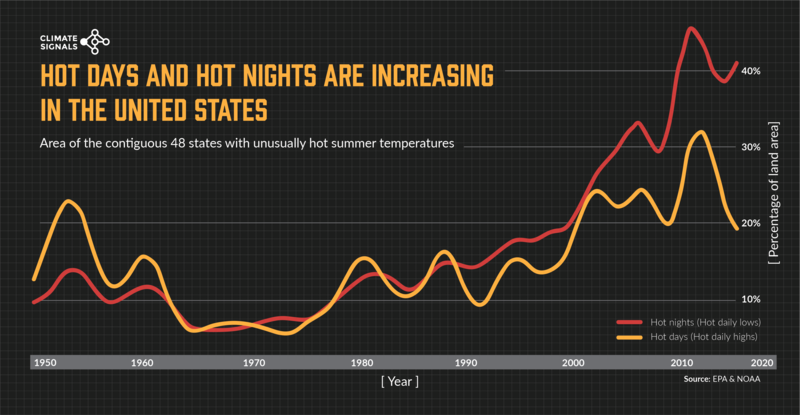 Hot nights are particularly characteristic of climate change on a warming planet. There has been a dramatic increase in hot nighttime temperatures in the U.S., reducing the number of critically important relief windows during heat waves. A small shift in climate leads to a dramatic increase in the frequency of extreme temperatures. These events occur on multiple time scales—from a single day or week, to months or entire seasons—and are defined by temperatures significantly above the historic average for that period. High temperatures and heat waves are related but not synonymous concepts. Heat waves are generally understood to be acute periods of extreme warmth, though there is no single, standard definition of a heat wave. One definition, provided by the World Meteorological Organization, defines a heat wave as follows: A marked unusual hot weather (Max, Min and daily average) over a region persisting at least two consecutive days during the hot period of the year based on local climatological conditions, with thermal conditions recorded above given thresholds. In a warming climate, extreme cold temperatures decrease precipitously, while extreme hot temperatures increase dramatically. The very most extreme events are the events most affected by climate change. However, even the impact of climate change on "moderate" heat waves (i.e. 1-in-3 year events) is dramatic, with a 75 percent share of such heat events now attributed to climate change. … more than half of the hot extremes worldwide...can be attributed to global warming. Not one of these events is solely the direct result of warming, but warming increases their frequency. And the less common and more extreme the hot extreme...the more this can be attributed to a man-made contribution. In a stable climate, the ratio of days that are record hot to days that are record cold is approximately even. However, in our warming climate, record highs have begun to outpace record lows, with the imbalance growing for the past three decades. The world is not quite at the point where every hot temperature record has a human fingerprint, but it's getting close to that. As the average global temperature rises and the climate shifts, hot temperatures that were extreme under the old climate are closer to the middle of the new temperature range. 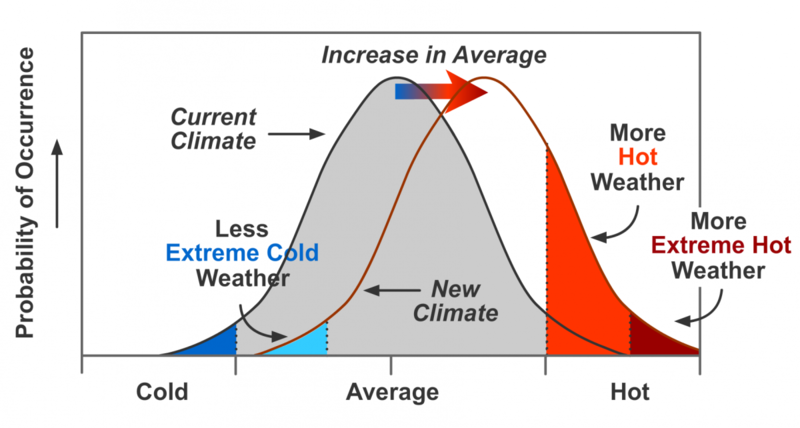 Under the earth's climate system, events closer to the midpoint of the climate range occur much more frequently than events closer to the extremes, as shown in the graphic on the right. The shifting bell curve also leads to the occurrence of never-before-seen extremes in high temperatures. ...it is the rarest and the most extreme events - and thereby the ones with typically the highest socio-economic impacts - for which the largest fraction is due to human-induced greenhouse gas emissions. In addition to shifting the distribution of local temperatures, global warming is altering the pattern of atmospheric circulation (e.g. the jet stream) as well. And some of these global changes are dramatically amplifying local heat extremes. Waves in the jet stream are stalling in place (as opposed to moving eastward), leading to blocking and persistent weather patterns that fuel the intensity and duration of heat waves. A video explainer is here. Heat waves are more frequent across the U.S. since the 1960s, with western regions setting records for numbers of these events in the 2000s. For nearly four decades, the average annual temperature in NOAA’s Southwest climate region has increased by 0.6°F per decade relative to the average annual temperature during 1951 to 1980. For context, the global average temperature has increased at a rate of roughly 0.27 to 0.36°F per decade. A July 2015 study found a significant shift in the concurrence of meteorological droughts and heat waves across the United States. New record high temperatures now regularly outnumber new record lows by a ratio of 2:1. This trend is one of the clearest signals of climate change that we experience directly. There has been a dramatic increase in hot nighttime temperatures in the U.S., reducing the number of critically important relief windows during heat waves. The increase in hot nighttime temperatures in particular is one of the signatures of climate change. The widely discussed spike in heat events in the U.S. during the 1930s has also been linked to human influence, but not to greenhouse gas emissions. Rather, widespread change in land-use practices (i.e. plowing up the prairies) led directly to the loss of topsoil from over 100 million acres which, in turn, created created dust-bowl conditions. And the subsequent loss of evaporative cooling dramatically amplified heat conditions far beyond what would have occurred otherwise. (Williams et al. 2017) finds that record‐high maximum temperatures drove record‐high atmospheric moisture demand during the 2016 southeastern U.S. drought, accounting for 28 percent of the October–November 2016 soil‐moisture anomaly. (Diffenbaugh et al. 2017) formally identify the fingerprint of anthropogenic warming in the observed trend of increasing heat extremes over the western U.S.
(Knutson et al. 2013) identify the anthropogenic contribution to the extreme seasonal March, April and May warmth in 2012 over the eastern United States as about 35 percent. In terms of risk, anthropogenic climate change leads to a factor of 12 increase in the risk of such an event. (Rupp et al. 2015), (Hoerling et al. 2012), and (Rupp et al. 2012) find that climate change contributed to the extreme heat and drought in Texas during 2011. Since 1950, the number and duration of heat waves worldwide has increased due to global warming. "It is very likely that there has been an overall decrease in the number of cold days and nights, and an overall increase in the number of warm days and nights, at the global scale." Summertime heat extremes—defined as three standard deviations (3σ) warmer than the climatology of the 1951-1980 base period—now cover about 10 percent of global land area, compared to much less than 1 percent of the earth during the base period. (Van Oldenborgh 2018) shows that almost everywhere heat extremes—defined as the highest daily average temperature of the year—are now warmer than a century ago, following the obvious first-order connection with global average temperature. (Mann et al. 2017) find that the sequence of consecutive record-breaking global annual temperatures in 2014, 2015, and 2016 had a negligible (less than 0.03 percent) likelihood of occurrence in the absence of anthropogenic warming. They estimate there is a 30 to 50 percent probability that three consecutive records would have been observed at some point since 2000 given anthropogenic warming, and there is less than a 0.7 percent chance the records would have occurred in its absence. (Kam et al. 2017) find that human-caused climate change is largely to blame for record warm surface temperatures in 2015. (Van Oldenborgh 2016) analyze the Nov-Dec 2016 warm event at the North Pole and surrounding Arctic region and find it would have been extremely unlikely in a world without human-caused emissions of greenhouse gases and aerosols. (King et al. 2016) identify a significant human contribution to the probability of record-breaking global temperature events as early as the 1930s. According to their research, all the last 16 record-breaking hot years globally had an anthropogenic contribution to their probability of occurrence. (Fischer and Knutti 2015) show that climate change has a dramatic impact on "moderate" heat waves (i.e. 1-in-3 year events), with a seventy-five percent share of such heat events now attributed to climate change. (Min et al. 2013) detect the human-caused signal in global and northern continental means of four temperature indices: coldest night, coldest day, warmest night, and warmest day. (Morak et al. 2013) identify the fingerprint of human-caused warming in observations for both cold and warm extremes, and cold and warm seasons, over the period 1951–2003. (Wigley and Santer 2012) find that there is a greater than 90 percent probability that the global warming due to human activity is larger than the total amount of observed warming over 1950-2005. This means natural variability would have had a cooling influence over this time. (Huber and Knutti 2011) present a new attribution method and find that since the mid-twentieth century, greenhouse gases contributed 0.85 °C of warming, about half of which was offset by the cooling effects of aerosols, with a total observed change in global temperature of about 0.56 °C. (Christidis et al. 2005) were the first to identify the fingerprint of global warming in hotter nights. This finding emerged before the impact of warming on hotter days. Model simulations using the A2 emissions scenario found that by mid-century, people in the U.S. can expect a four to six-fold increase in the number of days exceeding 95°F (35°C). If greenhouse gas emissions continue to rise throughout the 21st century, the Fifth Assessment Report of the Intergovernmental Panel on Climate Change projects that the global average temperature will rise 4.7°F to 8.6°F (2.6°C to 4.8°C) by 2081-2100 (relative to 1986-2005). The higher end of this estimate puts temperatures in 2100 close to one of the planet's warmest periods in history known as the Paleocene-Eocene Thermal Maximum (PETM), which occurred about 55-56 million years ago. During the PETM, the global mean temperature appears to have risen by as much as 9-14°F (5-8°C) to an average temperature as high as 73°F. During this time the poles were free of ice caps, and palm trees and crocodiles lived above the Arctic Circle. 9°F (5°C) is the difference between the last Ice Age, when half of North America was covered in a mile-thick ice sheet, and today. Whereas that warming occurred over thousands of years, the Earth has warmed by 1.8°F (1°C) in just over 100 years. The projected rate of temperature change for this century is greater than that of any extended global warming period over the past 65 million years.